Restauracje North Fish wzbogaciły się o ofertę Puzzle Snax! 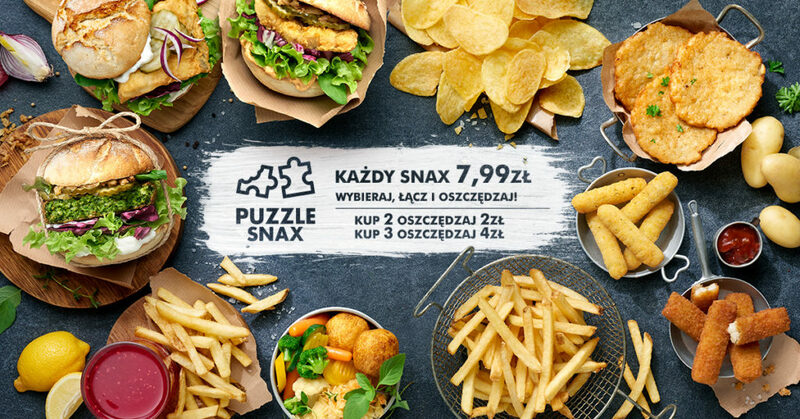 | North Food Polska S.A.
As of 5th of June North Fish restaurants have introduced Puzzle Snax range. The menu now includes many new meals. As part of the new promotion, customers can try natural potato crisps, traditional potato pancakes, crispy mozzarella sticks in gold batter, succulent Pollock sticks, quarter-kilo chips with skin and a small bowl of side dishes in “all you can eat” option. Sandwiches range now includes Vegeburger with spinach burger, fresh lettuce with perfectly enhanced taste with our in-house sauce and our exceptional fresh baked bread roll. “Choose mix and save” is the catchphrase for the new Puzzle Snax offer. By choosing from products in the PUZZLE SNAX range, the customer can mix them to create a meal; the bigger the meal, the higher savings. In addition to new products in the Puzzle Snax range, North Fish restaurants’ fish menu now offers Norwegian salmon caprese with slices of fresh ripe tomatoes stacked on a classic basil pesto and baked with mozzarella. North Fish is a chain of restaurants specialising in fish and seafood. The first was opened in 2002 in the Galeria Echo shopping centre in Kielce. Currently North Fish operates 38 restaurants located in Poland’s best shopping centres, which makes it the country’s unquestioned leader and Europe’s third largest, chain of restaurants offering fish and seafood. Each day nearly 1,000 employees take care to ensure the highest quality of the products served.